26 ¼ x 21 ¼ in. Gilbert Stuart, the pre-eminent American portraitist of the Federal period, was born in Rhode Island. He was active in New York, Philadelphia, and Washington, D.C., before he permanently settled in Boston in 1805. Stuart painted portraits of the most famous Americans of his era, and exerted a profound influence on the new generation of American portraitists. Stuart first painted George Washington in 1795 and again in 1796. The 1796 portrait, the model for the Washington portrait on the dollar bill, was left unfinished so that Stuart could keep it as a basis for further replicas. 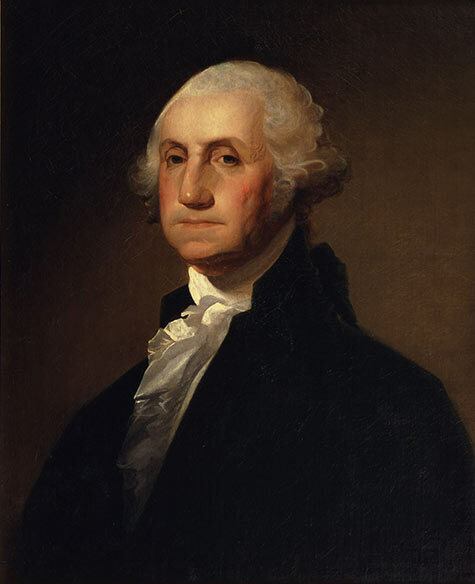 Ultimately, he painted Washington’s likeness more than 100 times. The painting seen here is one version of the unfinished portrait.